Self-catering rental company Blue Sky Cottages offers holiday rental properties ideally located to explore the Scottish Borders and Northumberland. With a unique history and beautiful landscape these are fascinating areas to visit. 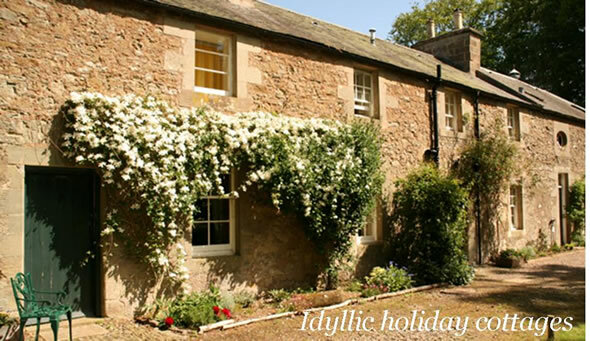 Blue Sky Cottages looks after the four luxurious self-catering holiday cottages within the private and secluded castle grounds of Wedderburn Castle. In addition the historic Old Linthill near Eyemouth is a fabulous seventeenth century tower house around 10 miles from the castle. Each property is maintained to the highest standard, seamlessly blending the charm of the eighteenth century with the height of modern comfort. Located in the heart of the Scottish Borders, a holiday cottage at Wedderburn is within easy reach of outdoor activities including fishing and golf, great walks and a multitude of historic sites from castles and battlefields to ancient abbeys. Whether you are travelling as a couple or with the whole family, Wedderburn is a fantastic holiday destination. All properties are dog-friendly holiday rentals. The West Lodge was recently re-built to form a spacious self-catering property, adjoining the West Gate of the castle grounds. The original fabric of the building, which dates from around 1820, has been retained while a contemporary element has now been added. It has been finished to the highest standard of comfort and includes Canadian pitch pine floorboards and locally-quarried flagstones. The oldest part of the building now forms a double-height kitchen and sitting room area with original wooden beams, an oversized stone fireplace and wood-fired stove. A glazed sun-room looks across surrounding lawns and leads to the newly-created bedroom wing. Sleeps six: two king size double rooms; one twin room; three modern, stylishly appointed bathrooms. Free WiFi. Holiday house that accepts dogs. A luxurious and romantic hideaway for two. Adjacent to the former kitchen garden at Wedderburn, it has views to the South facade of the castle and the Cheviot Hills. The first floor bedroom has a full-height window framing the view of the castle. A huge stone fireplace, complete with wood-burning stove, provides the focal point for the sitting room and the bright kitchen has French doors looking out across a spacious private lawn to the front. The floorboards that now add to the warm, atmospheric feel of the cottage were all cut from a single ancient ash tree that grew beside the castle and fell in a storm. Complimentary broadband WiFi. Sleeps two: One king-size double. Dogs welcome. 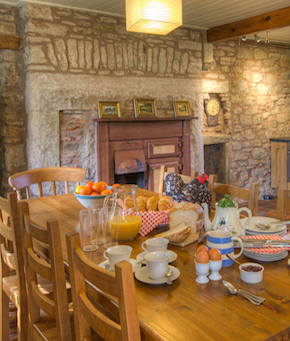 Keepers Cottage is a luxurious and character-filled country retreat, forming part of the eighteenth century stables and only a minute's walk from the castle. The cottage has been entirely restored to the highest standard. On the ground floor there is a spacious fully-equipped kitchen with oak fittings and farmhouse style dining table, while the cosy sitting room has a stone fireplace with log-burning stove and a beautiful ash floor cut from trees on the estate. Upstairs there are two comfortable bedrooms and two luxury bathrooms. Free WiFi is available. Sleeps four or six: One double/twin; one double. Double sofa bed in sitting room. Dogs welcome. Sleeps two: one double. Dogs	welcome. Located one mile West of the lovely small fishing port of Eyemouth, Old Linthill is an secluded seventeenth century Scottish tower house perched on a hillside in the centre of a beautiful small estate with private trout fishing on two rivers and woodland walks. There are four bedrooms on the second floor and three bathrooms plus a snug with additional king-size double sofa bed giving accommodation for up to 10 guests in comfort. There is a large sitting room with open fire, beautiful wood-paneled dining room and a well equipped kitchen. Complimentary broadband WiFi. Holiday house that accepts dogs. Sleeps eight or ten: Four king size doubles, one twin bunk bed. Advertised prices include bed linen, towels and luxury toiletries as well as central heating, hot water and electricity. Logs from the estate and a luxury hamper are available if ordered in advance. Wedderburn Castle, Duns, Berwickshire, TD11 3LT, Scotland, UK.